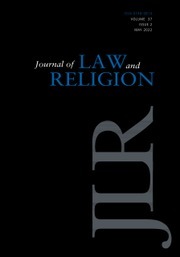 The Journal of Law and Religion publishes cutting-edge research on religion, human rights, and religious freedom; religion-state relations; religious sources and dimensions of public, private, penal, and procedural law; religious legal systems and their place in secular law; theological jurisprudence; political theology; legal and religious ethics; and more. The Journal provides a distinguished forum for deep dialogue among Buddhist, Confucian, Christian, Hindu, Indigenous, Jewish, Muslim, and other faith traditions about fundamental questions of law, society, and politics. THE BUREAUCRATIZATION OF RELIGION IN SOUTHEAST ASIA: EXPANDING OR RESTRICTING RELIGIOUS FREEDOM?